On a beautiful and warm morning in Maseru, Lesotho on Friday 16th November, 60 leading women entrepreneurs gathered together at the Avani Hotel and Leisure Resort for a morning of inspiration and business networking at the final Lioness Lean in event of the year in the country. And what a morning it was! 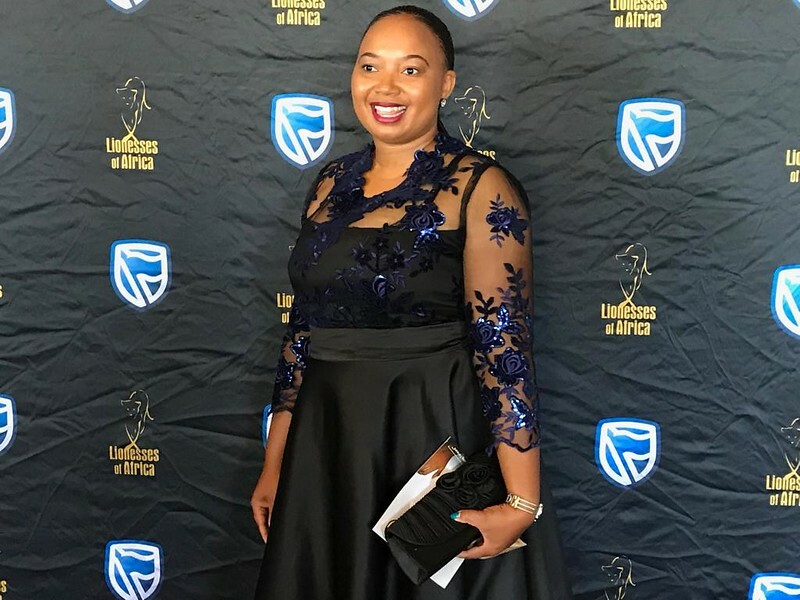 Co-hosted by Lionesses of Africa and Standard Lesotho Bank, the event aimed to inspire and connect women entrepreneurs from Maseru for greater business success. Guests were greeted on arrival with a warm welcome, a glass of chilled champagne and orange juice, and a shopping voucher to encourage them to do some great networking with fellow women entrepreneurs, and to visit the exhibition stands featuring some great products created by women business owners from Maseru. It was a great way to start the morning’s event proceedings. Kickstarting the programme in earnest was MC for the morning, Lineo Tsikoane, a powerful voice for women’s advocacy and economic empowerment in the country, and a successful lawyer by profession. She formally welcomed guests to the event and encouraged everyone to make the most of the opportunity to meet new potential customers and connections during the morning. Next to the speaker podium and providing a warm welcome and inspirational introduction to all guests at the event was Rethabile Mabaleha, Head of Marketing & Communications, Standard Lesotho Bank. She provided insights into the bank’s support for women owned businesses and outlined the aims of the partnership with Lionesses of Africa to advance and support the growth and development of women entrepreneurs in Lesotho. Melanie Hawken, founder and ceo of Lionesses of Africa then shared with the audience the very personal journey to building what is today the fastest growing network of women entrepreneurs on the African continent, with more than 730,000 women entrepreneurs in the community in all 54 African countries and across the global Diaspora. She talked about the many ways that Lesotho’s women entrepreneurs can access the wide range of support resources, tools and platforms available to them through Lionesses of Africa, including newsletters, digital magazines, podcast radio shows, events, mentoring programmes, and so much more. The highlight of the morning was the sharing of startup stories by some of Lesotho’s leading and most successful women entrepreneurs - these included Alicia Motsoane, Chief Executive Officer, Prestige Furniture; Matseliso Chondoma, founding member of Build It Group; and Likeleli Marethabile Sekhiba, founder and managing director of Scenery Guest House. Each of these inspirational women entrepreneurs shared their very personal journeys of how they became entrepreneurs, how they built their businesses and overcame all the personal challenges along the way, and also their vision and plans for the future of their businesses. Wrapping up the formal programme for the morning was Selloane Tsike, Director of Standard Lesotho Bank, who gave a detailed presentation on the wide range of products and services that have been developed for women entrepreneurs and their businesses in the country. A Q & A session followed, giving attendees the opportunity to ask specific questions relating to the financial management of their businesses. A popular regular feature of the Lioness Lean In events is the Lioness Launch, the opportunity for women entrepreneurs to pitch their new products, businesses and services to the audience. Five women entrepreneurs were selected randomly from the audience to take to the stage to pitch their businesses in one minute to attendees. These included Mamolemo Mokoaleli, founder of Mokoaleli Transport; Hape Marite, founder of Black Hair; Tlalane Maliteboho Mapota, Founder and Operations Manager at Mapota Logistics; Aliciah Motsoane, CEO of Sentebale Gap Funeral Services; and Irene Kabi, founder and MD of Motheo Hygiene. Each of the women entrepreneurs made their one minute pitches professionally and passionately, winning new fans and hopefully customers in the audience. Bringing the event to a close, Melanie Hawken, founder and ceo of Lionesses of Africa shared with the audience the various ways they could join the community and start to access all the resources, tools and platforms available to them. She also shared the news that a cohort of women entrepreneurs from Lesotho have been nominated to become part of the Lionesses of Africa and Cherie Blair Foundation for Women Global Mentoring Programme, a 12 month mentoring programme aimed at helping them to grow and take their businesses to the next level. The event closed with more networking and buffet snacks served with champagne, plus more shopping at the entrepreneur marketplace, a great way to end the morning.